They are the most highly-trained pilots in the world, but six months in space does amazing things, it reduces astronauts’ driving skills to those of an L-plater. A study accepted by Nature’s Scientific Reports Journal found that astronauts have a disastrous breakdown in their ability to drive and fly planes when they return to Earth after long-term space missions. Professor Steven Moore from Central Queensland University led the $US2.7 million ($3.75 million) NASA study, which tested the impact that zero gravity has on astronauts’ ability to operate machinery. “The commanders were actually saying to the NASA hierarchy that they were concerned about how their time in space was affecting their ability to land the shuttle,” Professor Moore said. “It was generally already known that there was some effect, but really the key thing was we were trying to find out what the underlying causes were for these effects. 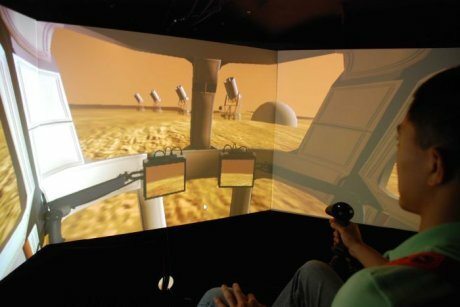 Between 2012 and 2015 the study tested eight astronauts through driving and flying simulators within a day of arriving back on Earth — activities the former military pilots knew well. Professor Moore said driving showed the most disastrous results. “It was quite interesting because a lot of them mentioned that during the six months in space they’d lost the sense of how big a car was around them,” he said. 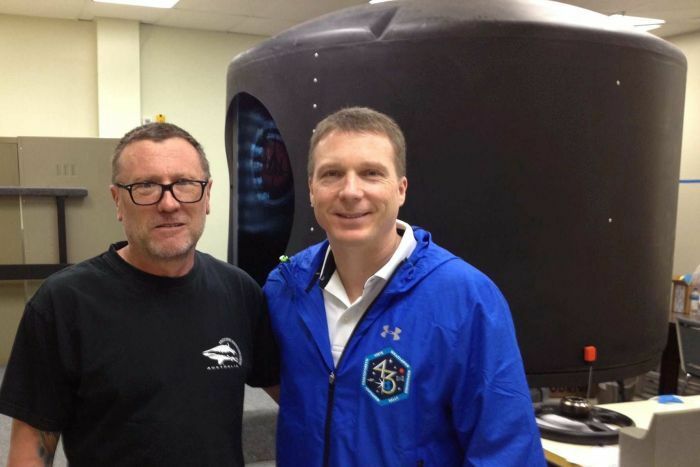 Lead researcher Professor Steven Moore (left) with astronaut Terry Virts in front of a simulator. Professor Moore said once the astronauts were integrated back into gravity, it took a while for their brains to work out just how to move [their bodies] around. “They’re essentially in a fragile state where their fine motor control is a little bit out, they’re having trouble working out where upright is, and they have that reduced capacity to handle multiple competing task requirements,” he said. The astronauts’ abilities were back to normal after four days. Chair of the Space Life Sciences Committee of the Australasian Society of Aerospace Medicine, Gordon Cable, said Professor Moore’s study had several implications for spacecraft technology that could be very expensive. “If these balance problems can’t be resolved, the astronauts may well have to wait three or four days in the lander before activities are undertaken on the planetary surface,” Dr Cable said. Professor Moore said the study highlighted how future missions would need to change. “Put into perspective, the 24–48 hours after landing on Mars for an astronaut is a very critical period, so this definitely needs to be taken into account for mission planning,” he said.